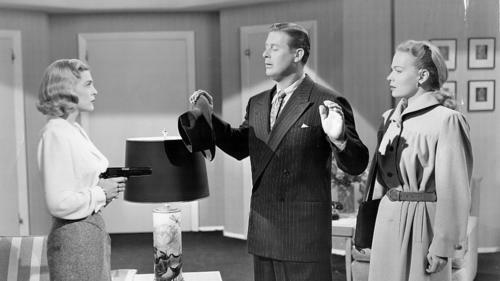 I just finished viewing the 1949 feature TOO LATE FOR TEARS on TCM. The title may sound like a weepy tearjerker, but this is film noir dynamite. Once incomplete due to falling into public domain, the UCLA Film & Television Archive have restored it to its black & white glory. I’d never seen this one before, and it was time well spent. It’s based on a Saturday Evening Post serial by screenwriter Roy Huggins, who later went on to produce television classics like MAVERICK, RUN FOR YOUR LIFE, and BARETTA. TOO LATE FOR TEARS can hold it’s own with the better known noirs of the era. Alan and Jane Palmer are driving down a lonely LA highway when a satchel is tossed in their car by another driver. They discover the bag’s loaded with cold, hard cash. They’re chased by the intended party, but manage to elude them. When the couple opens the bag at their apartment, Jane’s money lust is palpable. See, she was married once before to a man who committed suicide when he lost his fortune. Jane yearns to return to the easy life and sees this cash as a way out. Sensible Alan argues they should turn it over to the cops, but greedy Jane persuades him to stash it in a train station locker for a week, until cooler heads can prevail. While Alan’s at work, Jane gets a visit from slimeball Danny who says he’s a cop. After nosing around a bit, he tells her he’s the guy the bag was intended for and threatens her. Not willing to give up her claim on the dough, Jane entices the bum into helping get the money in exchange for half. Danny goes along and agrees to meet her at the lake. Alan and Jane go on a fateful boat ride, where she shoots her husband and has Danny switch clothes with the corpse. Then they tie an anchor to him and drop the poor sap at the bottom of the lake. Jane creates an elaborate ruse to convince everyone that Alan’s run off. But Alan’s little sister Cathy has her doubts, and grows suspicious. An old Army buddy of Alan’s named Don drops by to visit his pal. But Don’s not what he seems to be (no one is in this movie!). Jane plots with Danny to poison little sister and get her out of the way. Instead, Danny ends up poisoned by duplicitous Jane. She ends up hightailing it with the loot to Mexico. Jane’s really living it up on her ill-gotten gains, until Don shows up and the truth is revealed….. The ending’s a doozy, and Jane gets her final comeuppance in the film’s climax. TOO LATE FOR TEARS is all about crosses and double-crosses, greed, lust, and murder. The cast is full of dependable actors. 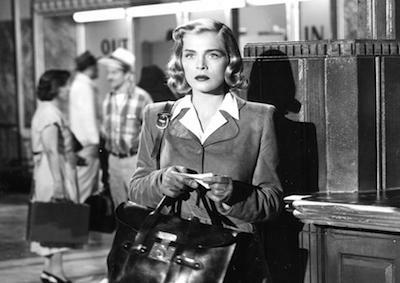 Lizabeth Scott stars as Jane, the ultimate femme fatale. Scott got her big break in DEAD RECKONING (with Humphrey Bogart), and went on to film noir stardom in I WALK ALONE, DARK CITY, and THE RACKET. She even played opposite Elvis in LOVING YOU. Dan Duryea (Danny) has long been one of my favorite actors. His sleazy touch can be seen in SCARLET STEET (a real gem), LARCENY, CRISS CROSS, and WINCHESTER ’73. Don Defoe (Don), usually cast as the lead’s sidekick, is more recognizable for the sitcoms OZZIE & HARRIET and HAZEL. Always dependable Arthur Kennedy doesn’t make it through the first third of the movie, but is fine as straight laced Alan. If you don’t blink, you’ll spot Denver Pyle, Billy Halop of the Dead End Kids, and MICKEY MOUSE CLUB host Jimmy Dodd in small uncredited roles. Byron Haskin was a top cinematographer and headed Warner Brothers’ special effects department before turning to directing in the late 40s. He keeps a tight reign on this one, but is best known for his work in science-fiction films like WAR OF THE WORLDS, CONQUEST OF SPACE, ROBINSON CRUSOE ON MARS, and the 60s TV anthology THE OUTER LIMITS. TOO LATE FOR TEARS, despite the sappy title, is a great little piece of filmmaking. Independently produced by Hunt Stromberg (RED DUST, THE THIN MAN) and originally released through United Artists, this is a movie that will satisfy any film noir buff. Thank you UCLA for your continued work in saving these lesser known pieces of Hollywood history. And as always, thanks to TCM for giving us all the privilege of watching them again and again.